Say goodbye to summer with this easy watermelon and feta salad with mint recipe. It's the perfect watermelon salad recipe to serve at your end of the summer cookout. In this Watermelon Salad with Mint & Feta recipe, I combine watermelon chunks with gluten free rice vinegar and lime juice, both of which contrast well with the sweetness of the fruit and the saltiness of the feta. This healthy salad recipecan goes great with barbecue and is the perfect side dish to bring to parties. Many people ask me for my Watermelon Salad with Mint & Feta recipe at cookouts, so please share! 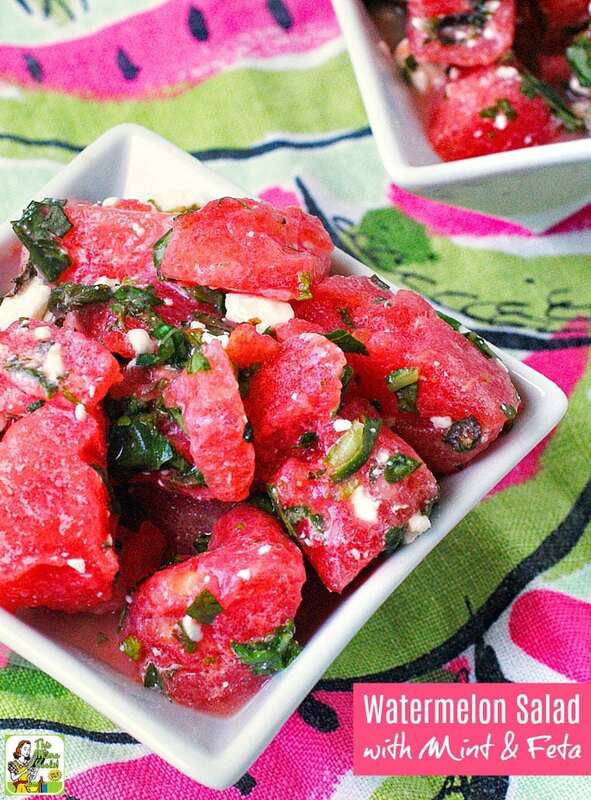 Make Watermelon Salad with Mint & Feta a family project! The kids help you make this recipe for watermelon feta salad by cutting up the watermelon in small chunks by using child safe kitchen knives. And if they snack while they cook? No biggie as we all know how healthy fruit is! If you don’t want the kids to use any kind of knives, even child safe ones, a melon baller is another option when making a watermelon and feta salad with mint recipe a family project! Don’t throw out those watermelon rinds. Keep them to make Best Watermelon Rind Pickles! 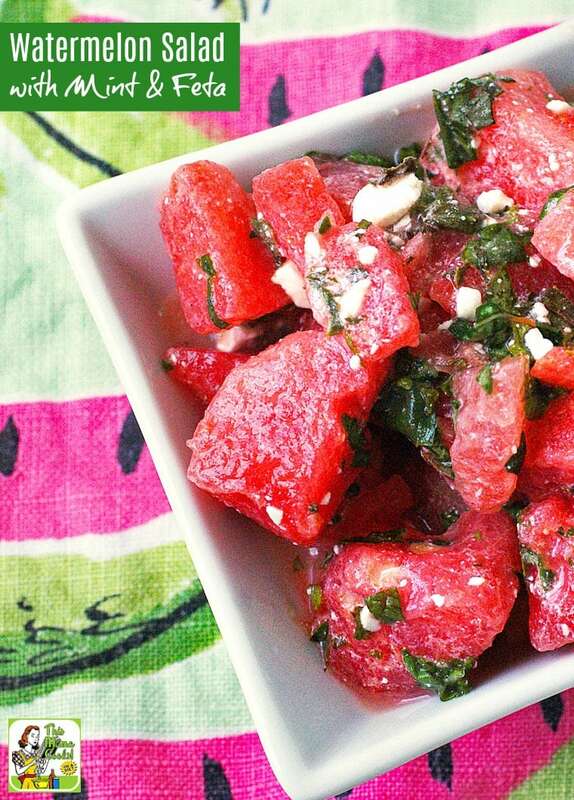 Bring watermelon feta mint salad to a potluck party! 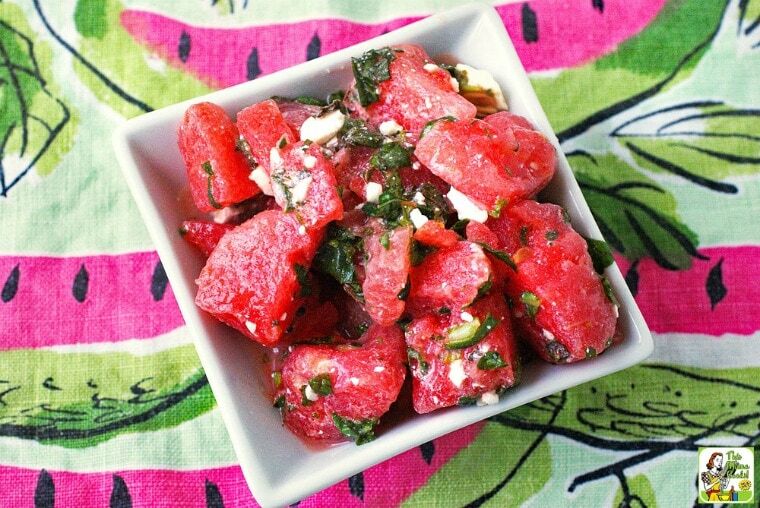 What’s so terrific about Watermelon Salad with Mint & Feta, beside that it’s naturally gluten free, is that it’s the perfect potluck dish. Everyone loves it! If you go to a lot of potlucks or bring in dishes to share at work, treat yourself to an insulated potluck carrier to transport it safely and keep it cold. I love the Rachel Ray Expandable Lasagna Lugger since it can be used to transport hot and cold foods. You can also use it to carry two dishes to the party or just use it for one dish. Super versatile! Don’t forget to bring a serving spoon with you to the party. Nothing worse than trying to serve your easy watermelon salad with feta cheese recipe with a tiny plastic spoon! Combine and gently toss ingredients in a decorative bowl. Serve. Originally published on July 22, 2011. Updated with new pictures and information. Love this combination of flavors! It’s been a challenge to use up all of that watermelon for us, so thrilled that the recipe will help you out, too!